The Sega Genesis, known as Mega Drive (Japanese: メガドライブ Hepburn: Mega Doraibu?) in most regions outside North America, is a 16-bit video game console which was developed and sold by Sega Enterprises, Ltd. The Genesis is Sega's third console and the successor to the Master System. Sega first released the console as the Mega Drive in Japan in 1988, followed by a North American debut under the Genesis moniker in 1989. In 1990, the console was released as the Mega Drive by Virgin Mastertronic in Europe, by Ozisoft in Australasia, and by Tec Toy in Brazil. In South Korea it was distributed by Samsung and was first known as the Super Gam*Boy and later as the Super Aladdin Boy. Designed by an R&D team supervised by Masami Ishikawa, the Genesis hardware was adapted from Sega's System 16 arcade board, centered around a Motorola 68000 processor as a primary CPU and a Zilog Z80 as a secondary processor. The system supports a library of over 900 games created both by Sega and a wide array of third-party publishers and delivered on ROM-based cartridges. It can also play the complete library of Master System games when the separately sold Power Base Converter is installed. The Genesis also benefited from numerous peripherals and several network services, as well as multiple first-party and third-party variations of the console that focused on extending its functionality. In Japan, the Mega Drive did not fare well against its two main competitors, Nintendo's Super Famicom and NEC's PC Engine. However, it achieved considerable success in North America and in Europe, capturing the majority of the 16-bit market share in several territories including the United States and the United Kingdom. Contributing to its success were its library of arcade game ports, the popularity of the Genesis-exclusive Sonic the Hedgehog series, several popular sports game franchises, and aggressive youth marketing that positioned the system as the cool console for adolescents. Though Sega dominated the market in North America and Europe for several years, the release of the Super Nintendo Entertainment System resulted in a fierce battle for market share in those territories that has often been termed a "console war" by journalists and historians. As this contest drew increasing attention to the video game industry among the general public, the Genesis and several of its highest-profile games attracted significant legal scrutiny on matters involving reverse engineering and video game violence. Controversy surrounding violent titles like Night Trap and Mortal Kombat led Sega to create the Videogame Rating Council, a predecessor to the Entertainment Software Ratings Board. 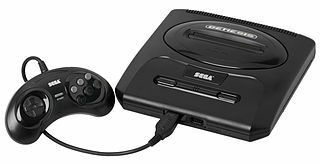 By the end of 1994, when a new generation of 32-bit consoles rendered the system technologically obsolete, the Genesis had sold 29 million units worldwide, and by the end of its life Sega had sold an estimated 40 million units. Thanks to Patrick Pace for his contributions in adding cartridge descriptions. Skitchin Slap Fight Slaughter Sport Smash T.V. Sorcer Kingdom Sorcerers Kingdom Rev 1 Sorcerian Space Funky B.O.B.